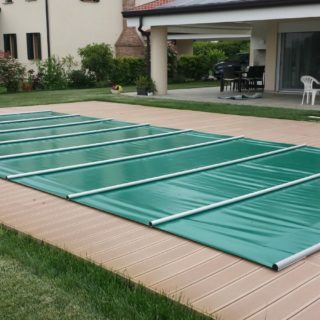 Realizzate in tessuto di polietilene 100% con doppia spalmatura e trattato anti UV, ozono e cloro, sono fornite generalmente completamente impermeabili, esistono tuttavia versioni forate a rete utilizzate in casi particolari. 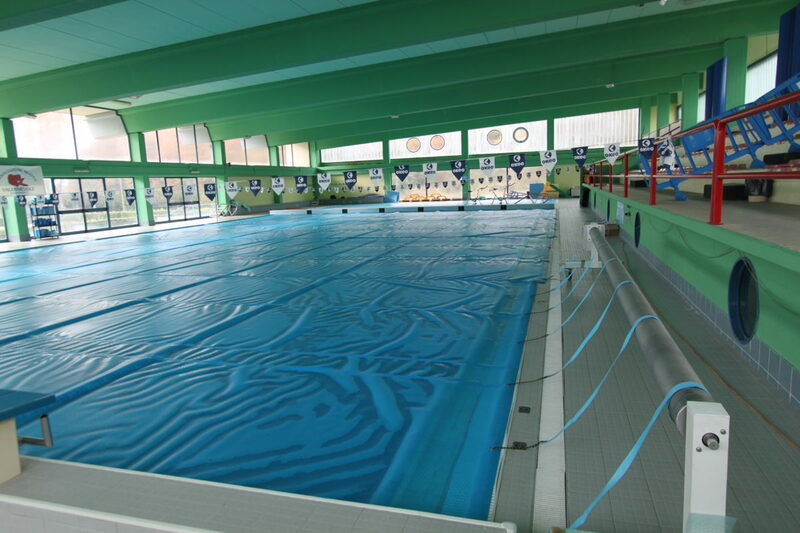 Possono essere posizionate mediante dei serbatoi perimetrali in PVC saldati (riempiti d’acqua) oppure dotati di occhielli e fissati con elastici a pioli a scomparsa o picchetti. 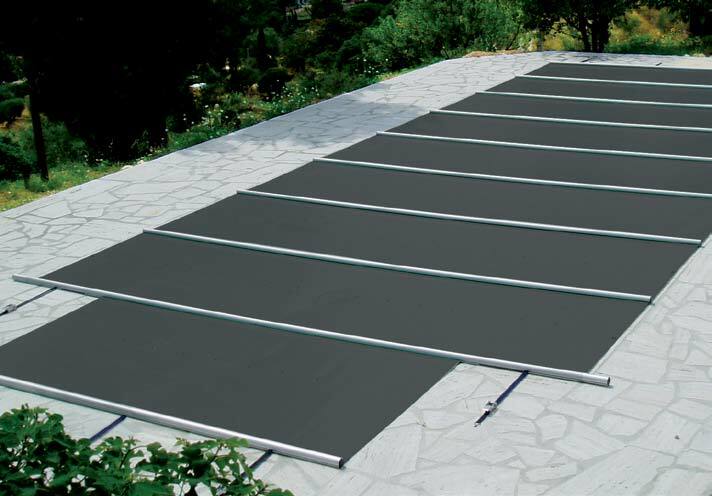 WHY USE A HEAT RETENTION COVER? 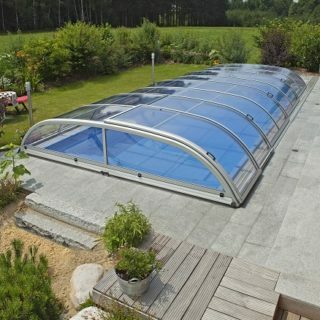 Would you ever buy a house without a roof? 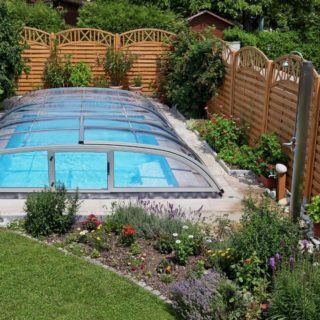 A house without windows or doors? 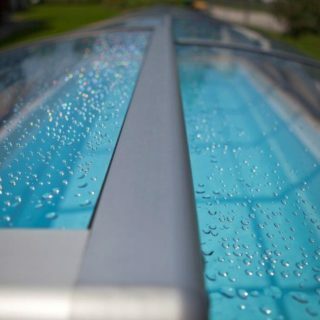 It would definitely be interesting, but surely inefficient and unhygienic. 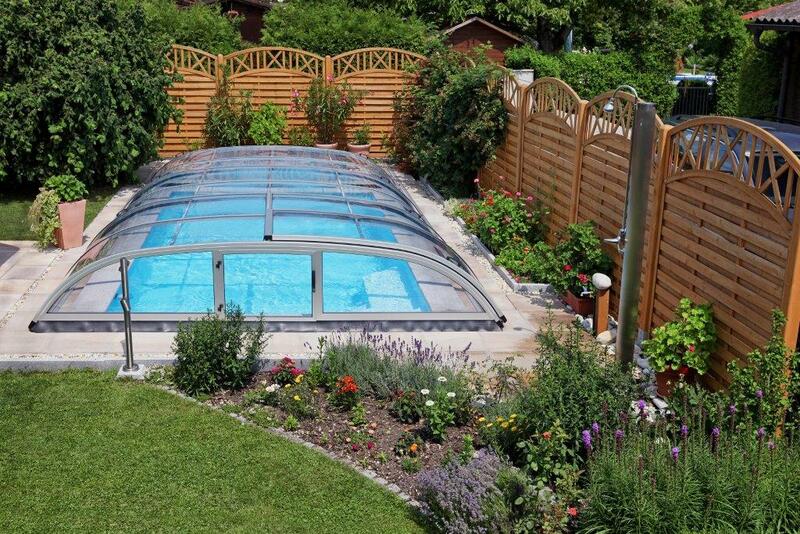 Try to imagine the heating bill and the amount of cleaning required… unbearable! 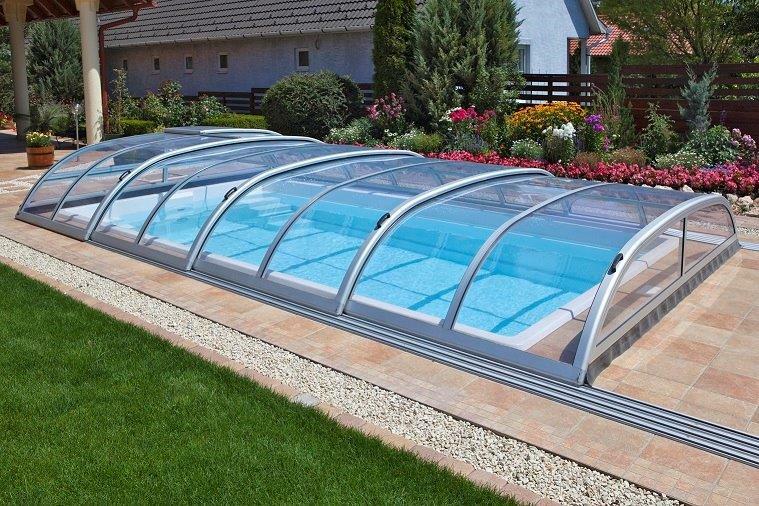 The same applies for a pool: throughout the day, water absorbs the sunlight and it warms up, providing ideal comfort for swimmers. 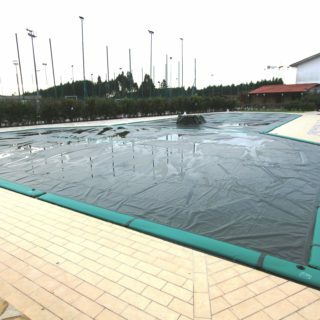 Overnight, if the pool is not adequately covered, the accumulated heat dissipates by means of evaporation (70%), convection and radiation. 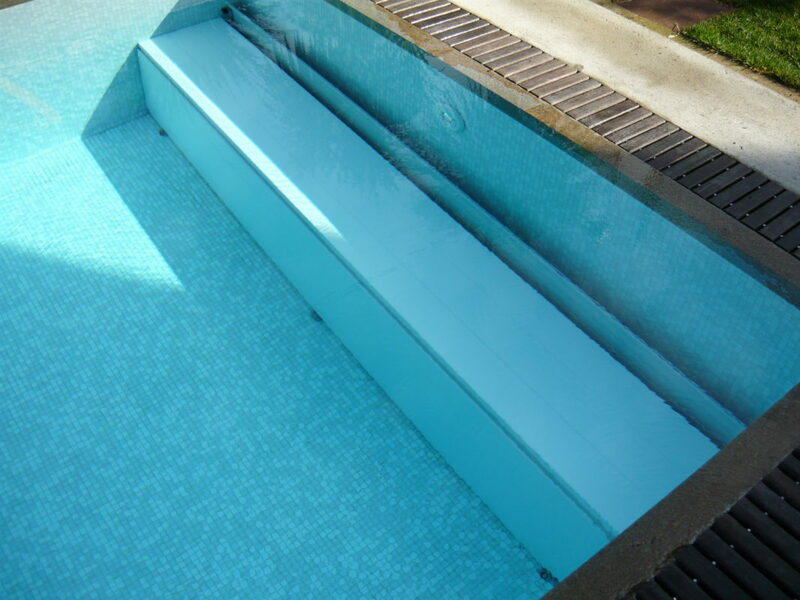 Evaporation, that is by far the most common phenomenon as well as being responsible for dispersing large amounts of energy, increases the need to top water up and consequently increases the need for chemical products. 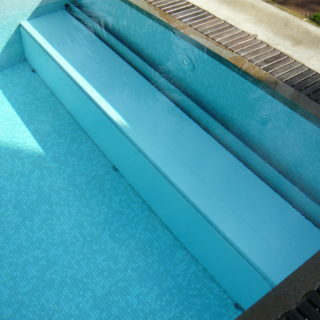 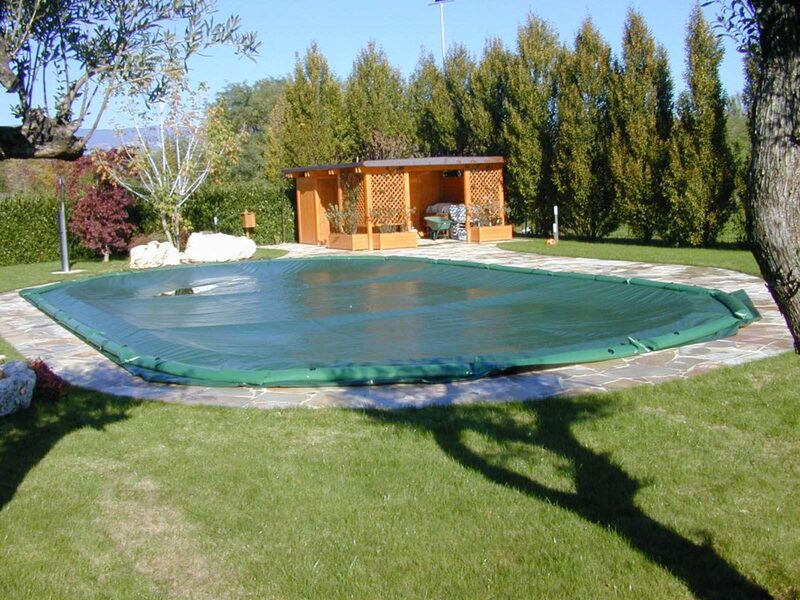 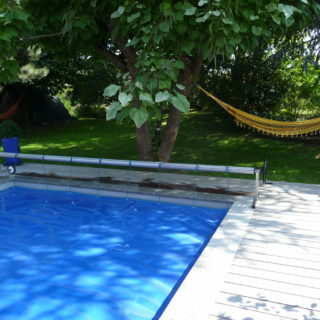 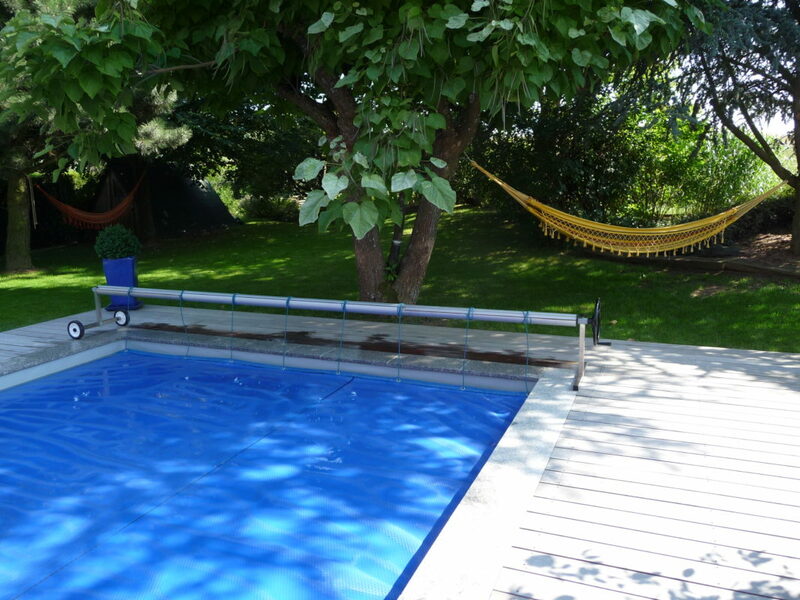 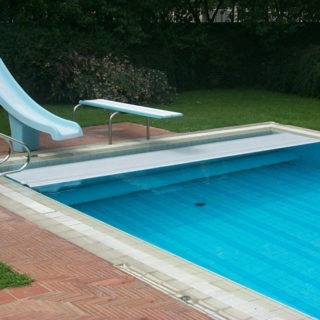 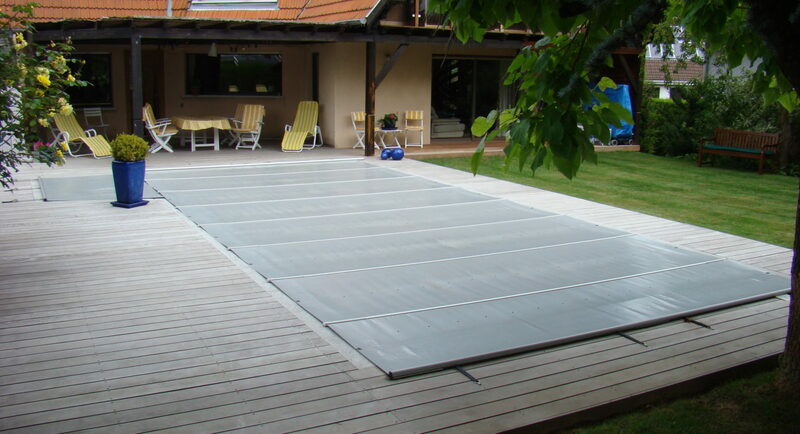 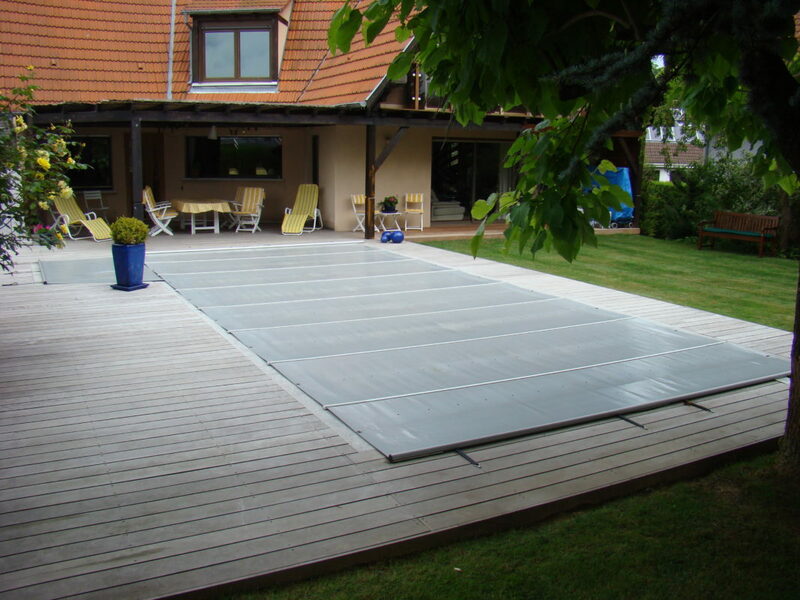 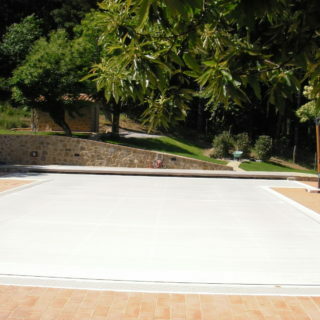 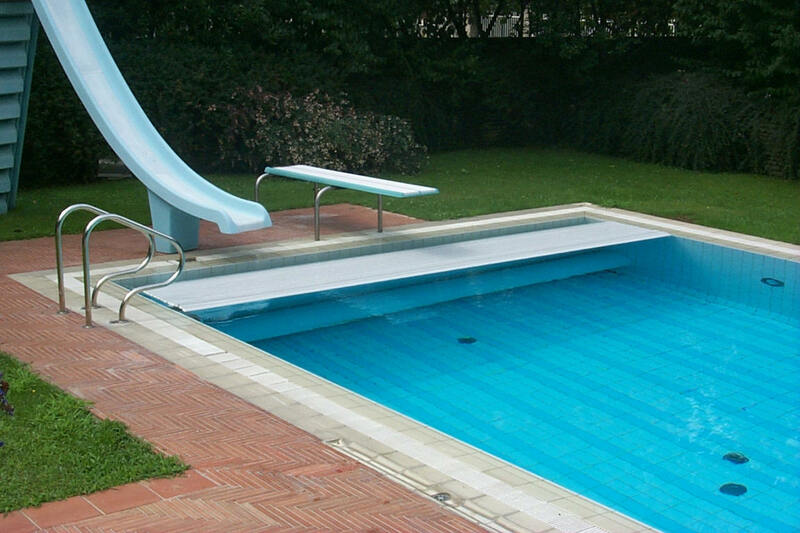 A heat retention cover also protects the pool from leaves, insects, branches, dust, etc. 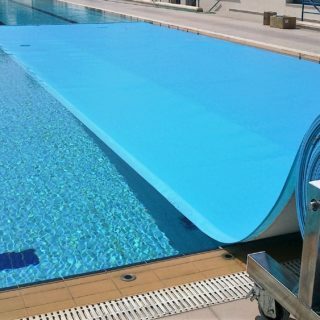 that inevitably contribute to increasing maintenance costs. 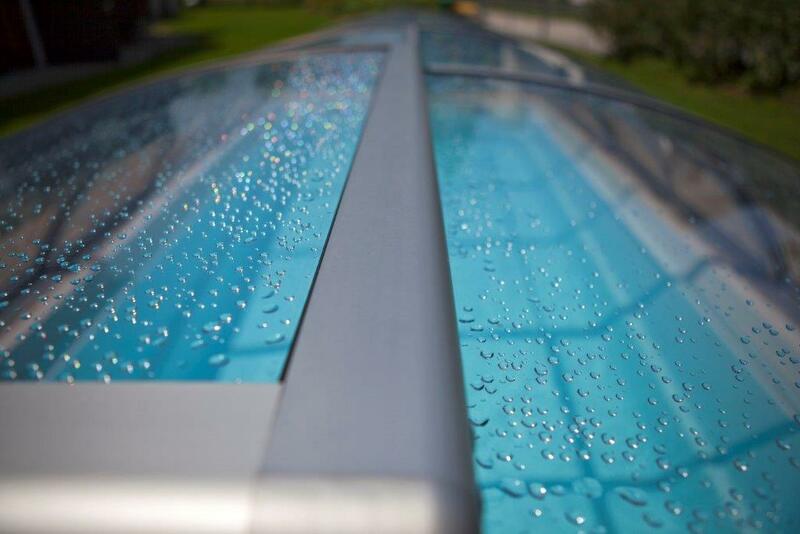 Halves the costs of water heating. 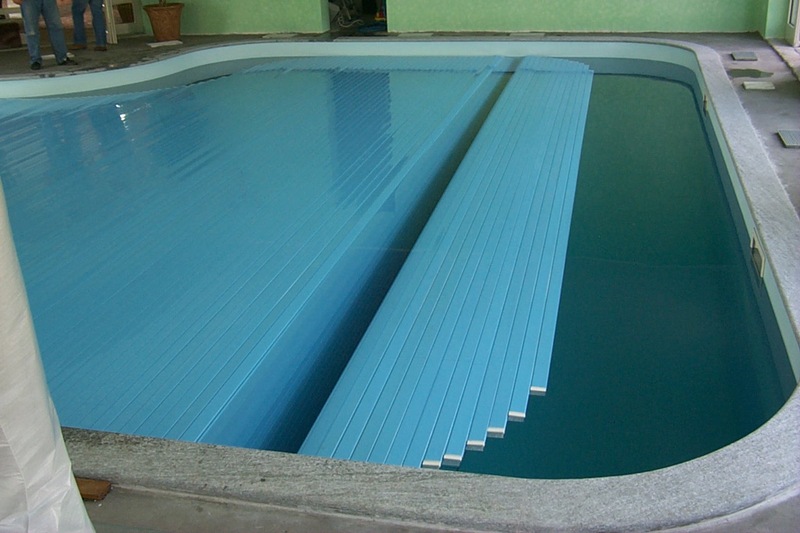 Reduces the consumption of chemical products by 35-40%. 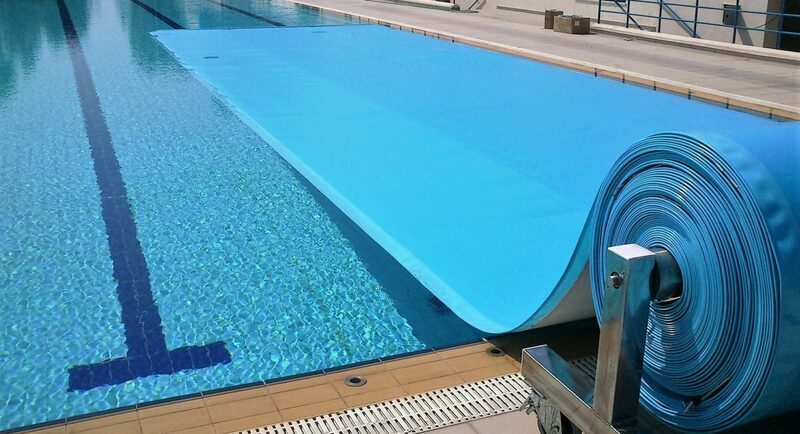 Reduces by 50% the need to top water up. 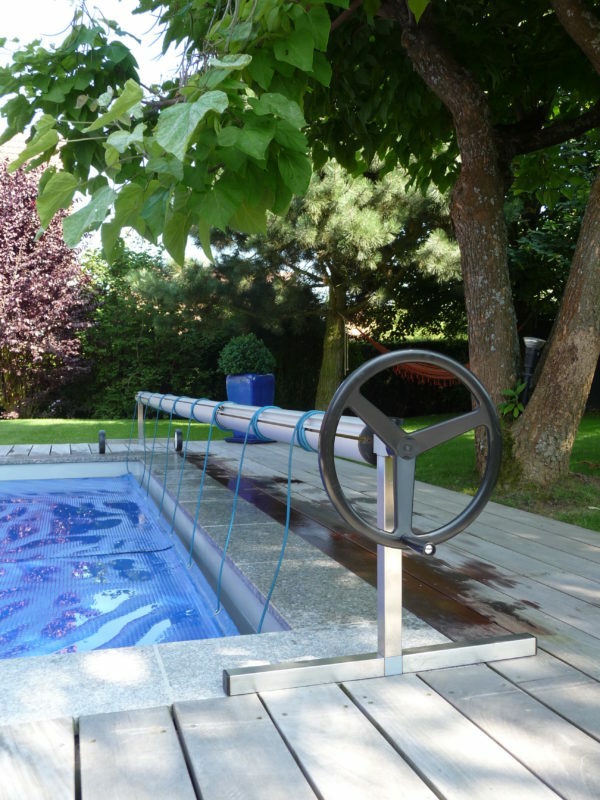 Reduces the time needed to filter/pump water into the pool by 50%. 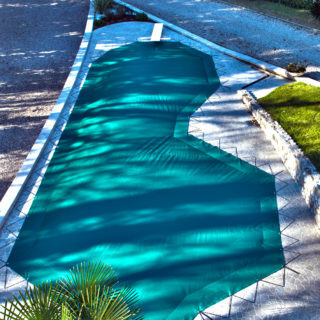 Keeps cleaning and maintenance costs down. 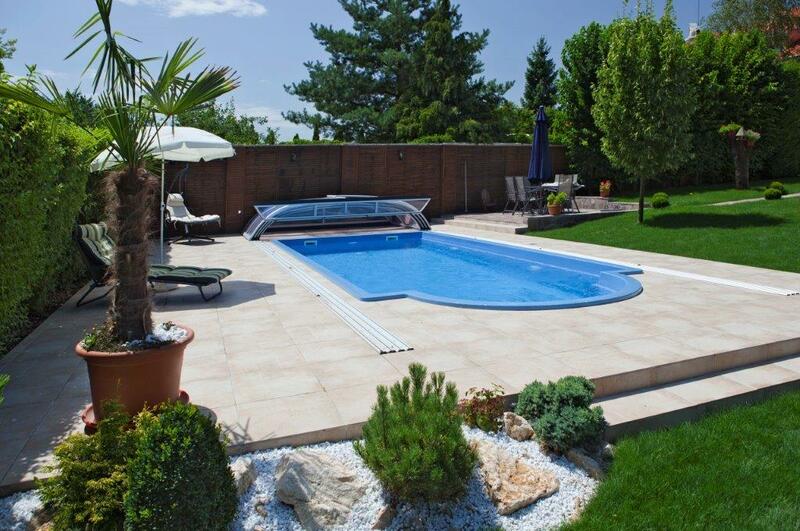 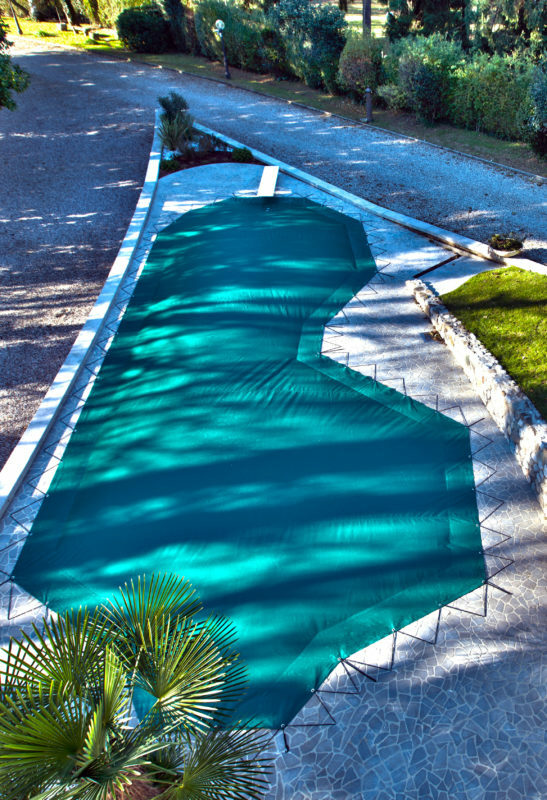 PoolGard is the unique pool cover able to guarantee the same benefits as three specific covers. 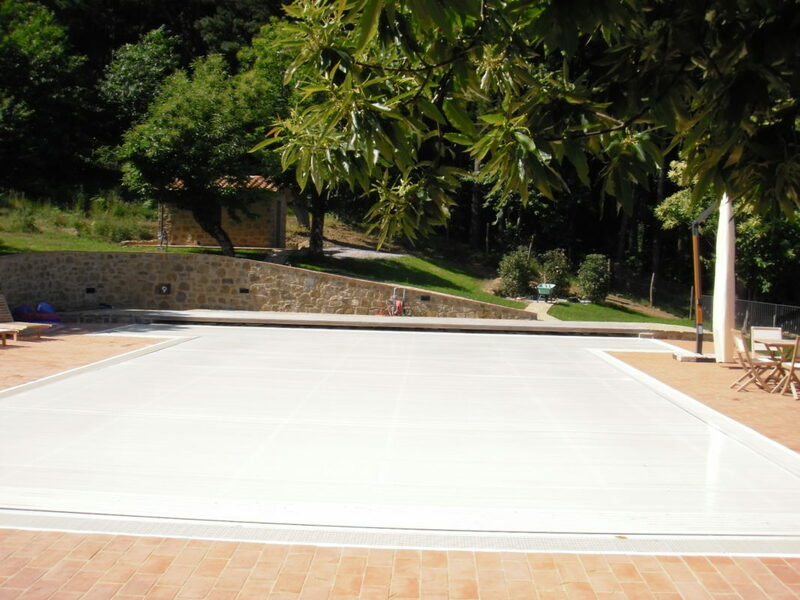 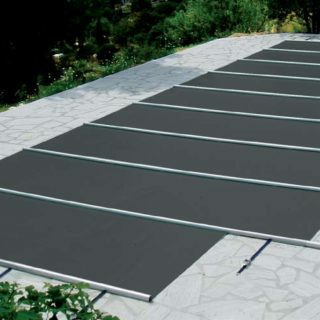 Heat retention cover during the summer: blocking evaporation, PoolGard will keep the water temperature constant. 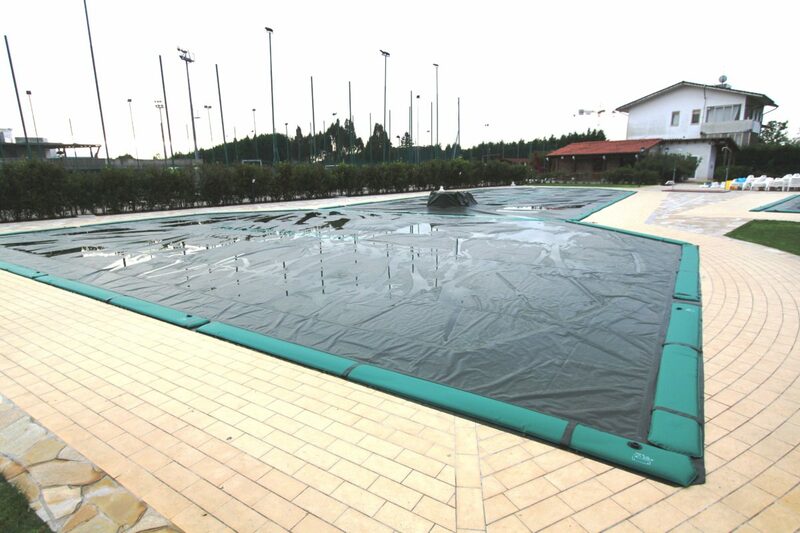 Winter debris cover during the winter: throughout the months in which the pool is not in use it will be protected from debris, the formation of algae and other microorganisms. 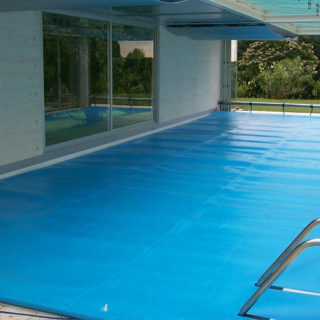 Safety cover: in compliance with the NF P 90-308 normative, PoolGard can withstand the weight of a child or a household pet. 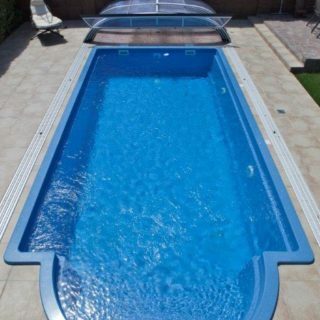 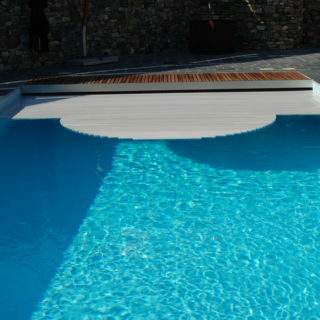 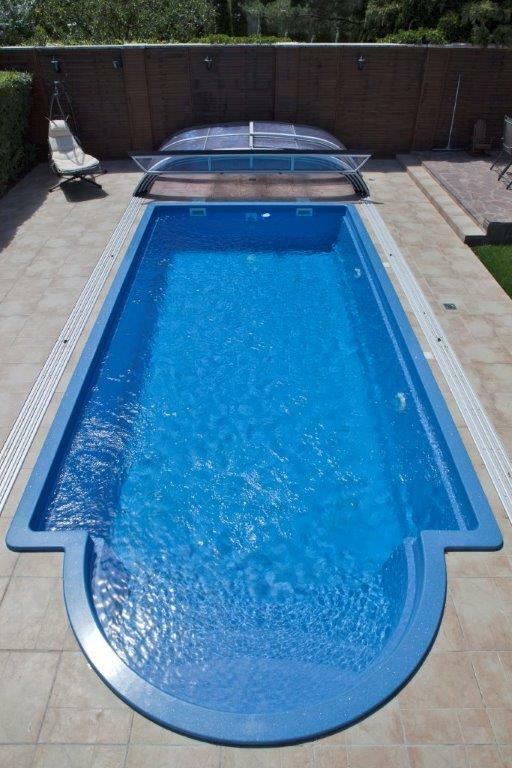 100% ADAPTABLE TO IRREGULAR-SHAPED POOLS! 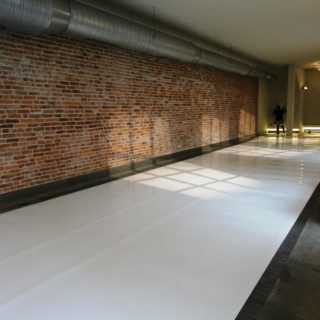 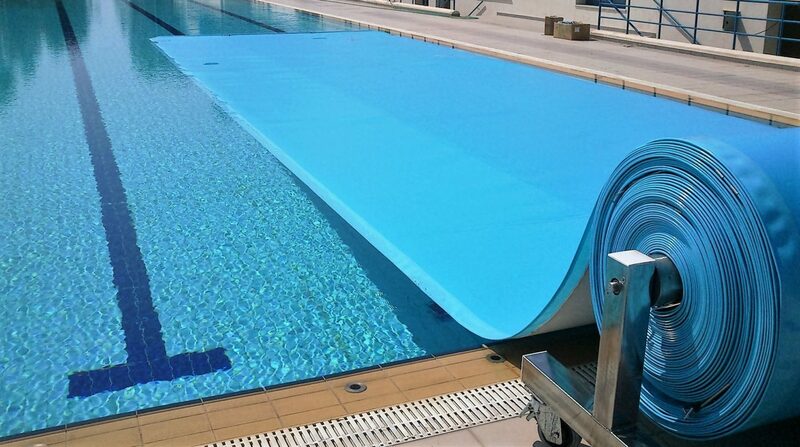 The panels and tubes that make up the cover are interchangeable and can be replaced, when necessary, even on the spot. 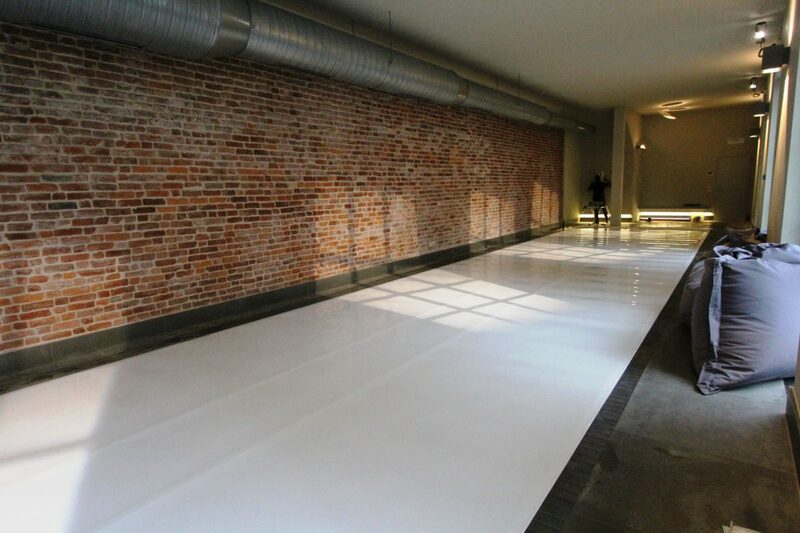 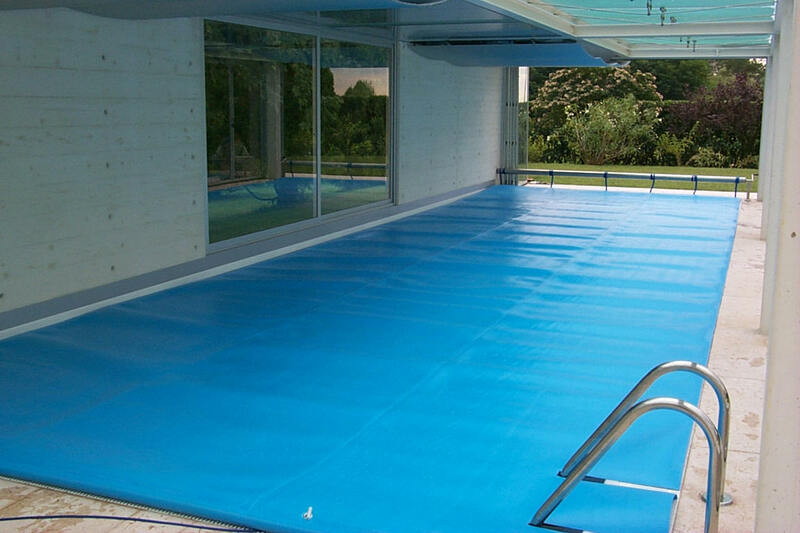 This allows you to still have a cover in case of damage while it is being fixed and, in the meanwhile, guarantees an exceptional aesthetic 365 day a year! 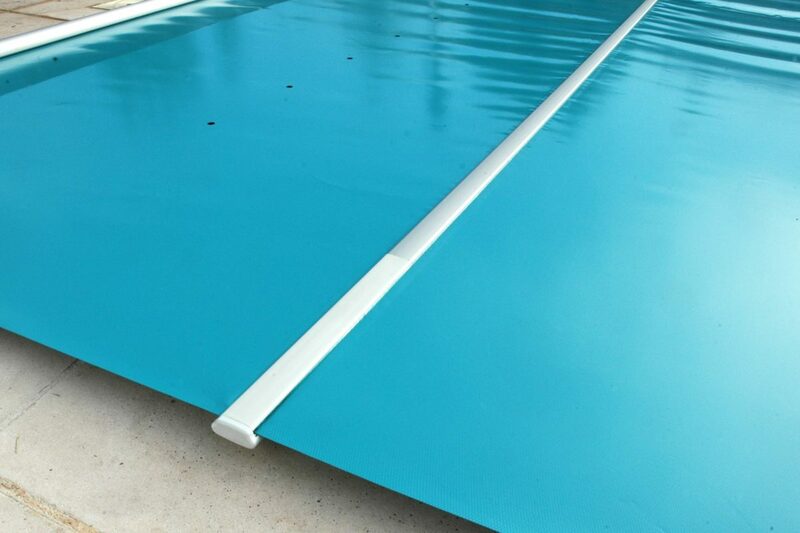 CONSTANT SAFETY, 365 DAYS A YEAR! 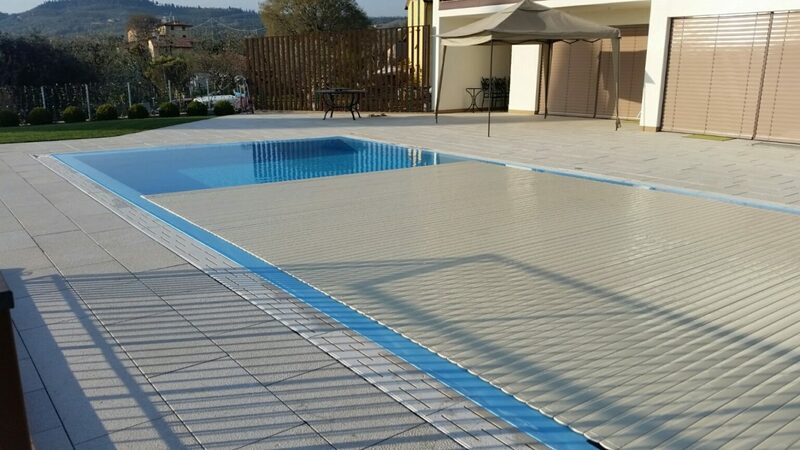 Automatic slatted covers for pools are the ideal addition to private residences, big recreational centres, spas and thermal swimming pools. 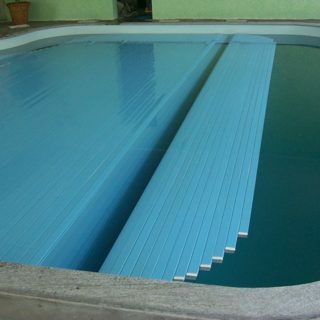 The automated covering system with rigid slates guarantees the utmost of safety on several fronts thanks to the high resistance of the PVC tiles with which it is made. 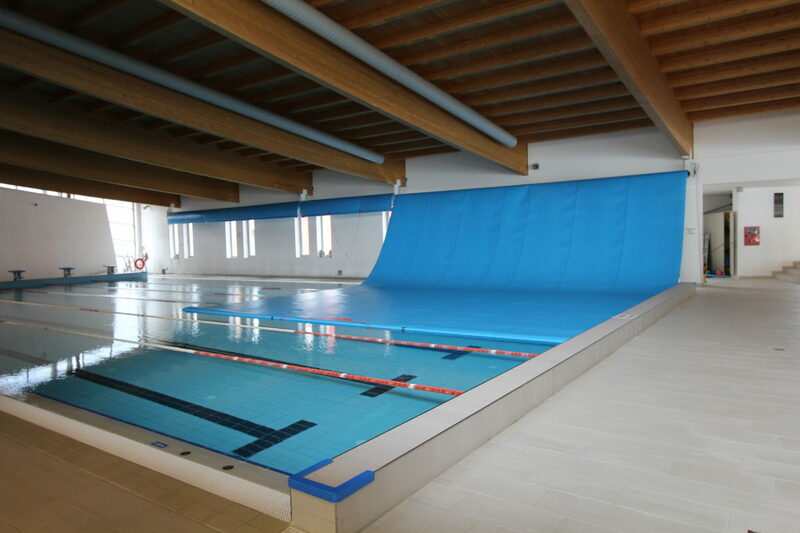 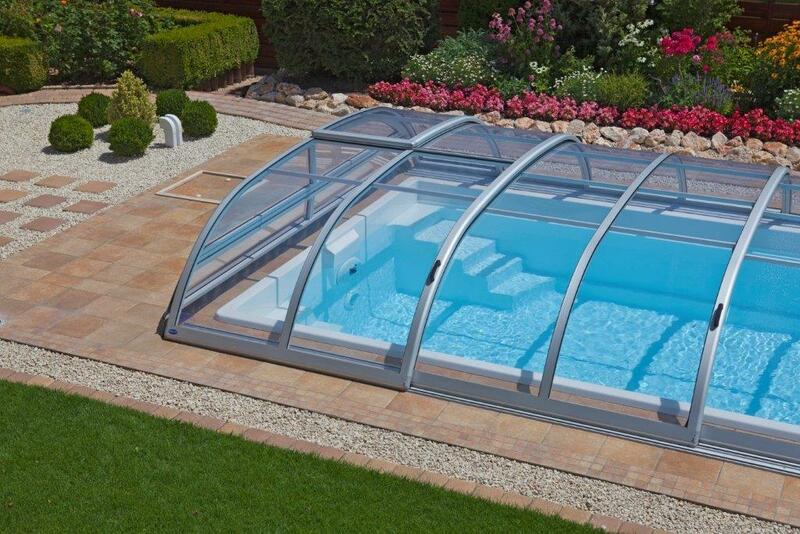 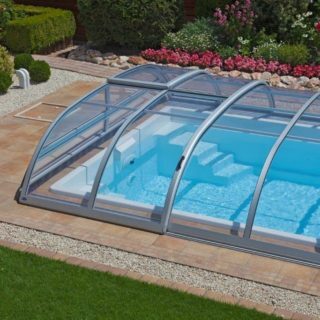 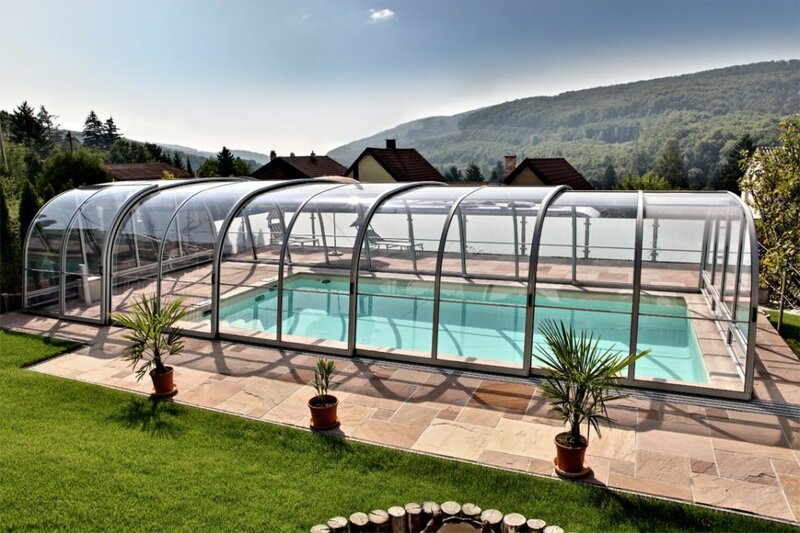 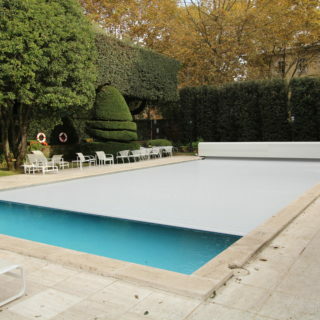 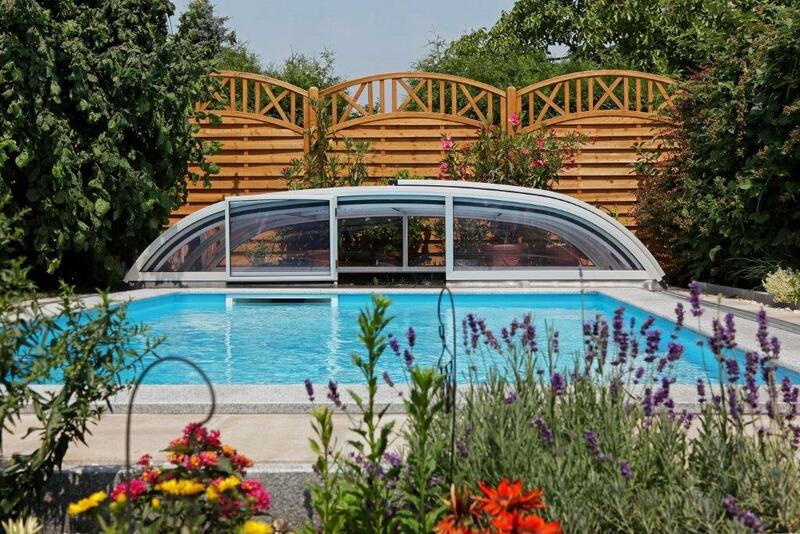 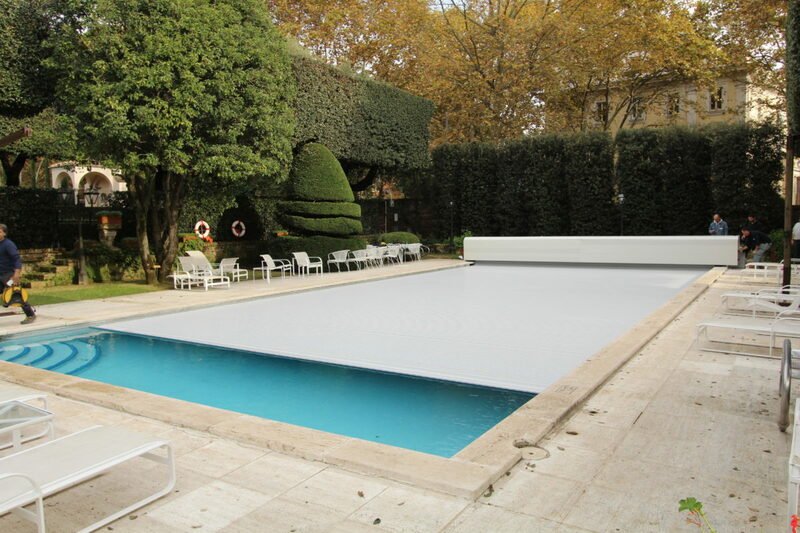 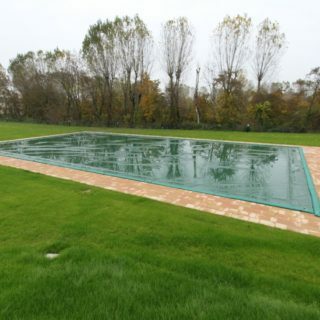 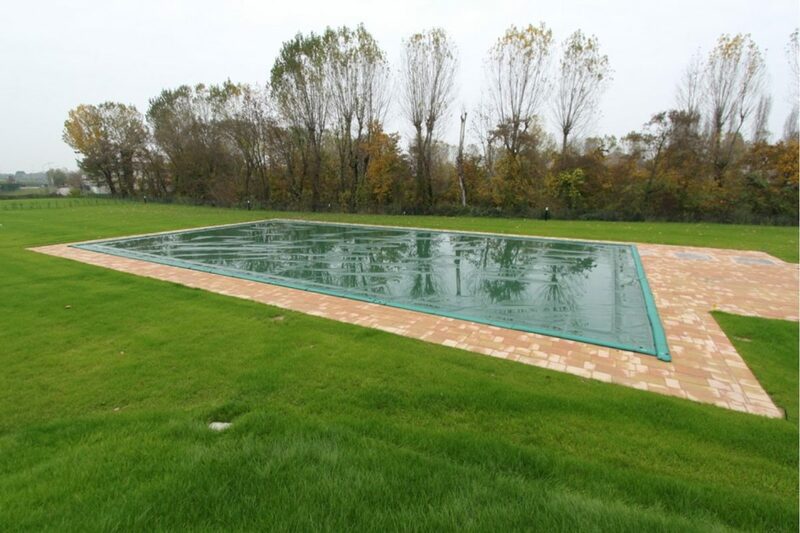 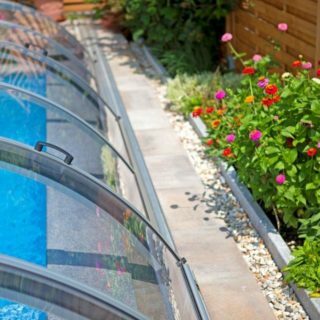 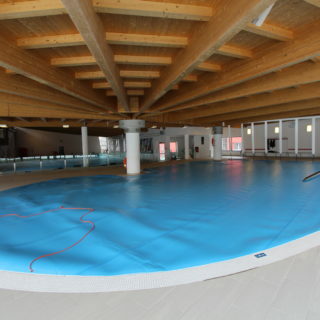 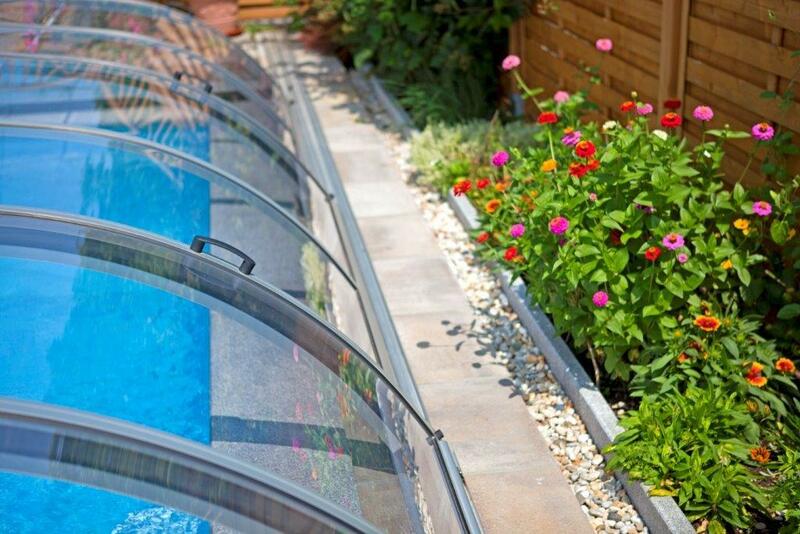 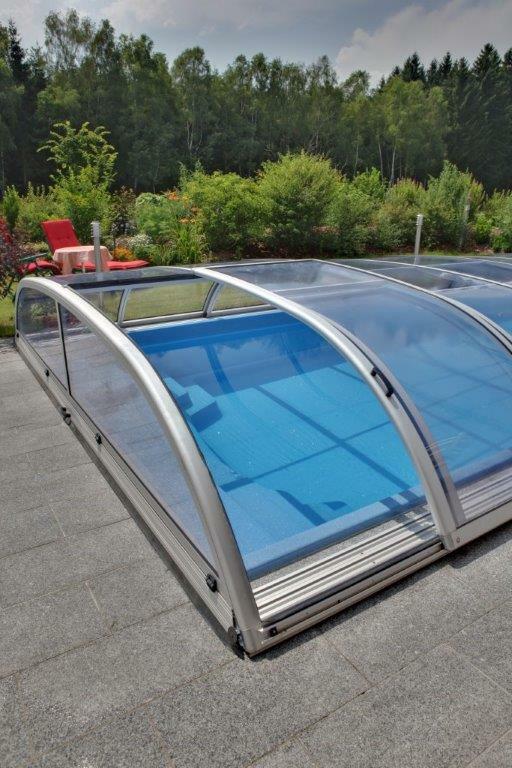 The cover in fact, guarantees a 360° protection all year round: during the summer it drastically reduces evaporation whilst in the winter it protects from atmospheric agents, keeping the pool in optimal conditions. 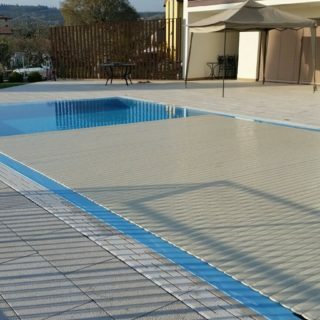 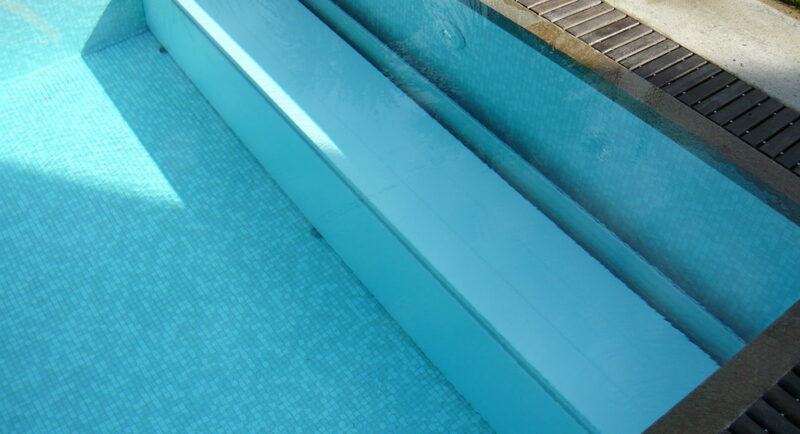 The automated slatted covers for pools are specifically designed to reduce maintenance costs up to 60% for both outdoor and indoor swimming pools. 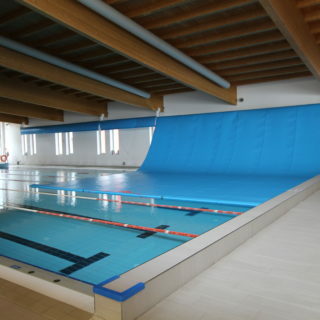 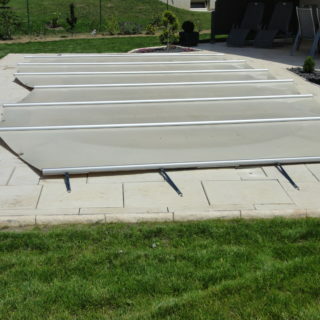 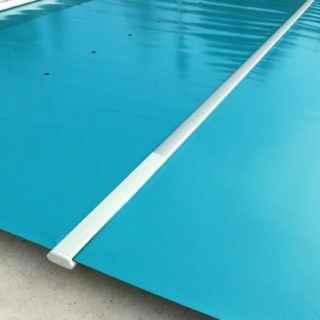 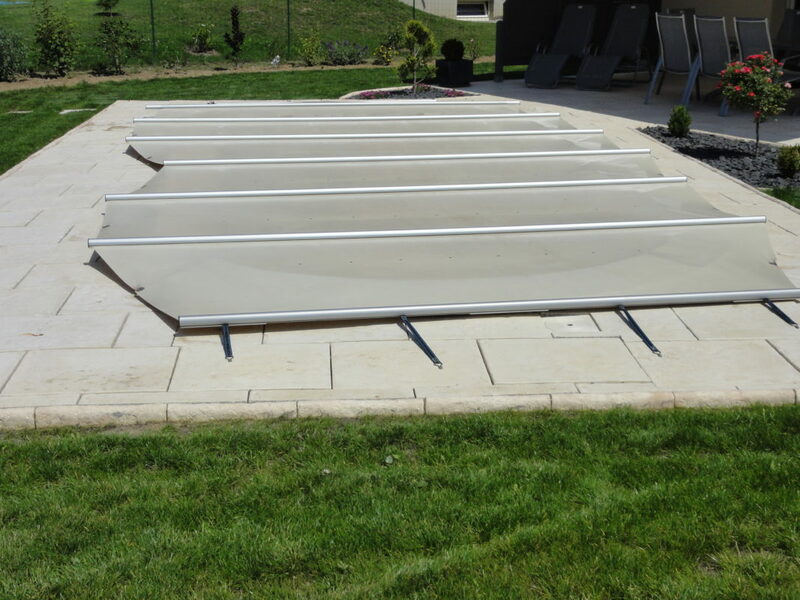 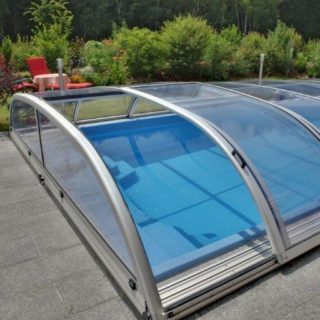 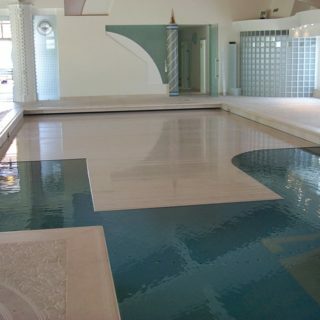 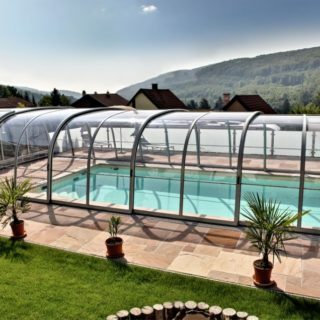 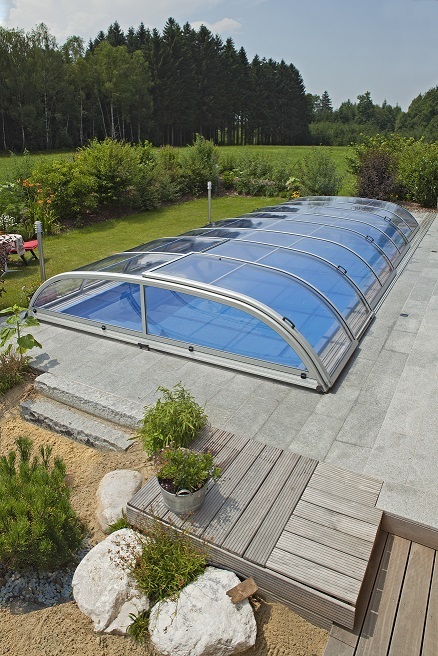 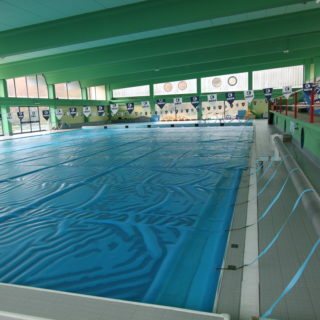 This type of covering for outdoor swimming pools allow the customer to use the swimming pool for more months than those that normally use depending on the atmospheric conditions; the peculiarity of this product, thanks to its particular shape, is in fact to exploit the “greenhouse effect” capturing the sun’s rays and increasing the swimming pool’s water temperature. 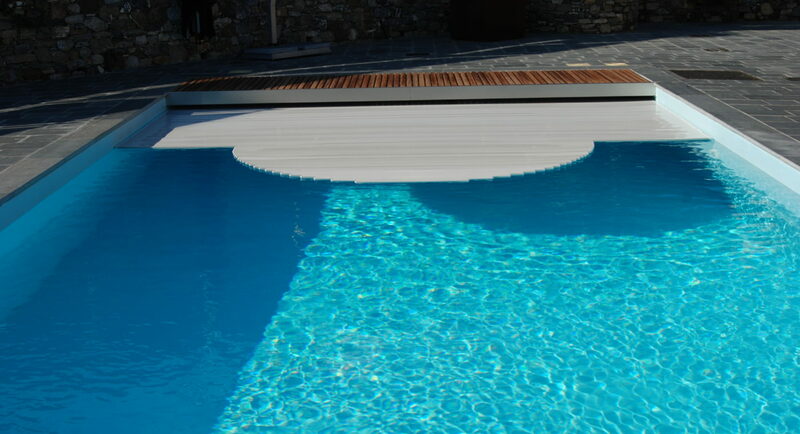 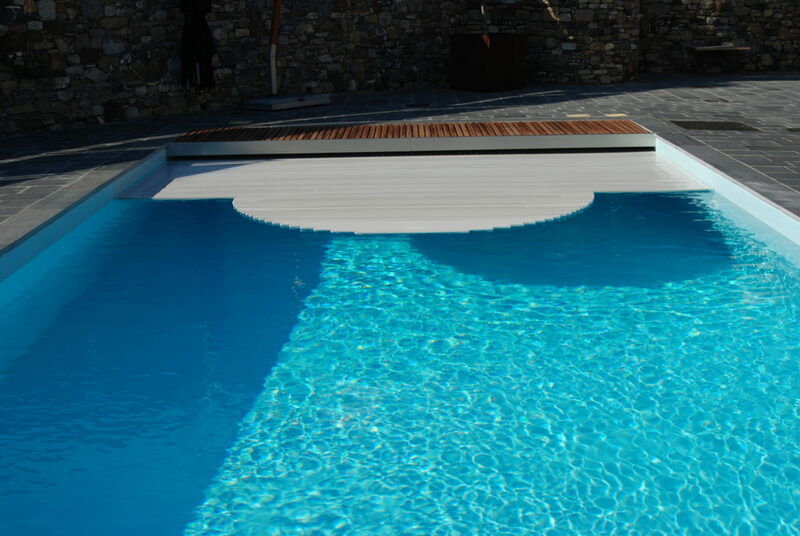 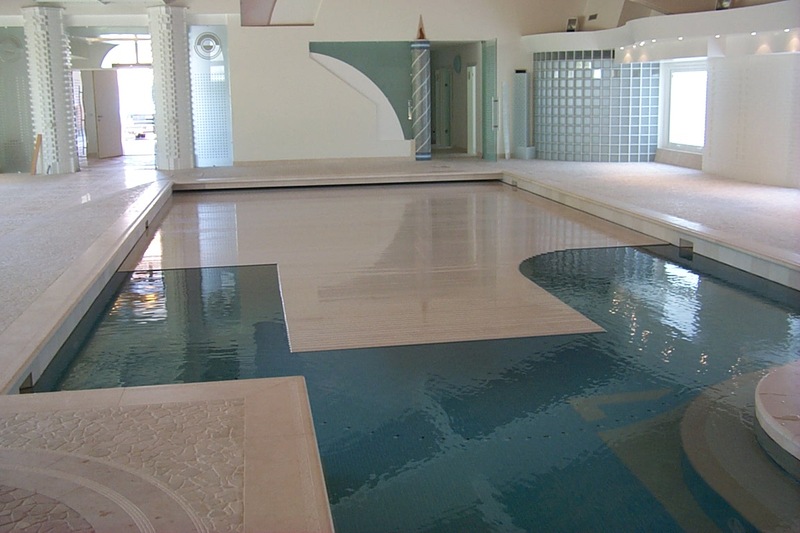 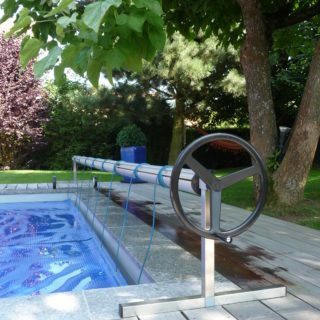 During the hottest periods, thanks to its telescopic system, forms a stack on a side of the pool reducing the encumbrance and allowing the use of the entire pool. 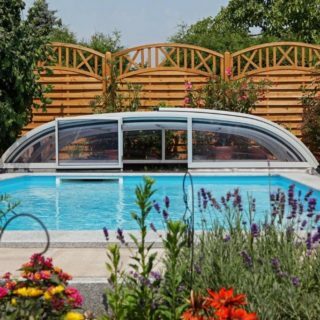 The structure is made of aluminum available in different colors, stained glass windows with UV protection are offered in two versions with different thicknesses, in honeycomb and SAN transparent polycarbonate. 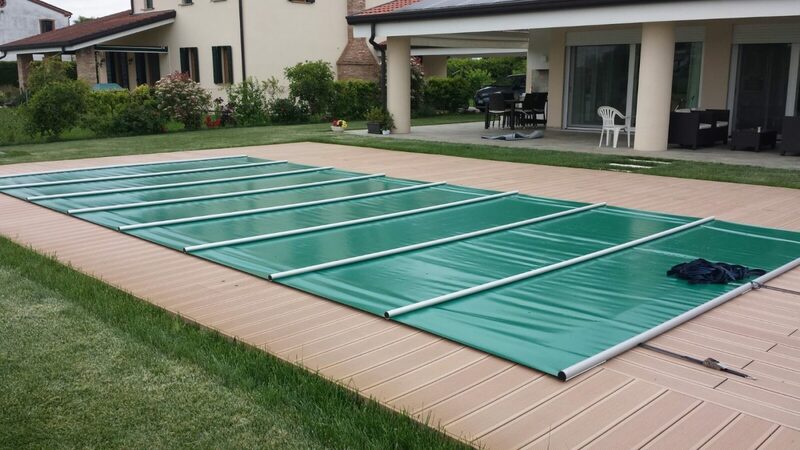 For the opening and closing of the modules, in an easy manner manually carried out, can be placed the appropriate tracks on the floor or equip the profiles of suitable sliding wheels.